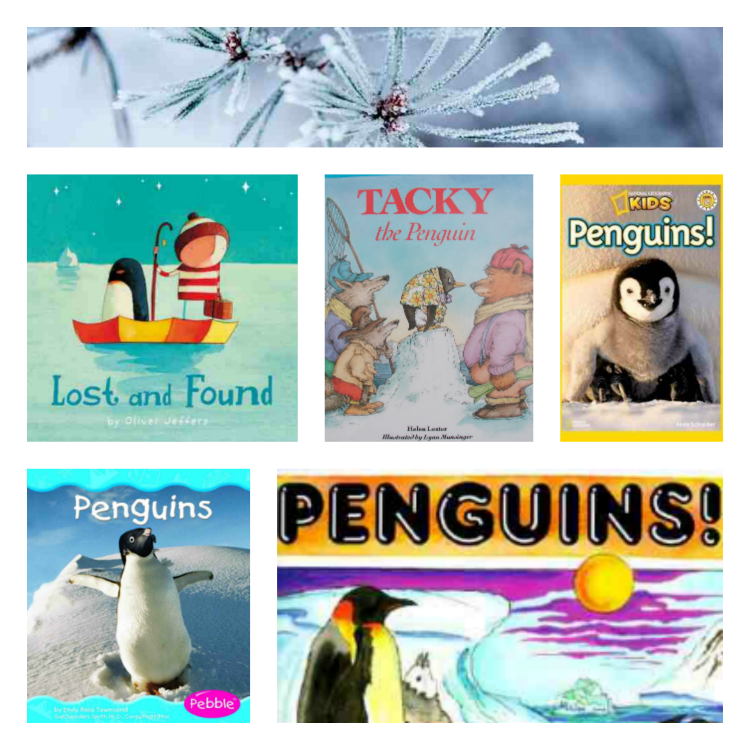 Penguins and polar bears are fascinating to many young readers. My boys love learning about these polar animals. 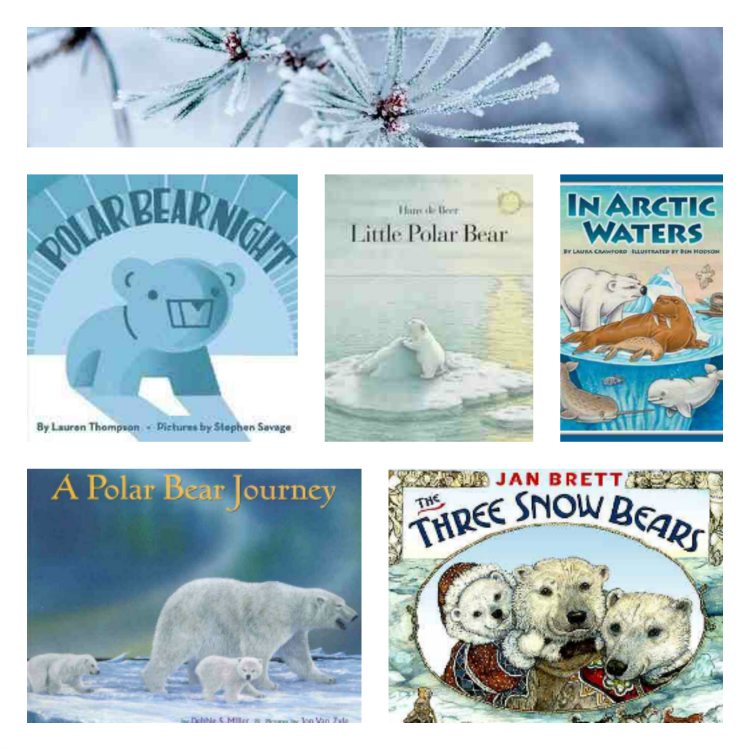 Winter can be a fun time to explore polar regions in books and book activities. I've rounded up some of our favorite picture books about polar regions. I've tried to group this book list into books about north pole polar bears and south pole penguins. There is a mixture of fiction and informational text. We've been doing a lot of book activities with these books. We've done crafts, writing activities, science experiments, and math practice. I'll be sharing these activities over the next few days. I'd love if you'd come back to check it out. You can also find all of the activities on my winter activities for kids pinterest board. Jan Brett tells the traditional tale of the the three bears in an arctic setting. Goldilocks is played by Aloo-ki, an Inuit girl. Aloo-ki's sled dogs float away on ice. As she goes to look for the dogs, she stumbles into the three polar bears igloo. The story then plays out much the same as the traditional tale. Polar Bear Night by Lauren Thompson is illustrated by one of my most favorite illustrators, Stephan Savage. In this story, an adventurous baby polar bear leaves the den in the middle of the night. His night time journey takes him past the common animals of the polar region. He explores a star show. Finally, the sleepy bear returns to the warmth of his mom. This is a sweet story. It's great for introducing some of the animals of the arctic region. In Arctic Waters by Laura Crawford introduces the animals of the arctic region by using the pattern of the rhyme, "This is the House that Jack Built". Children are introduced to many animals and given new vocabulary for these animals. There is also a section of facts in the back of the book. Over in the Arctic where the cold winds blow by Marianne Berkes is another arctic book based on a popular rhyme, "Over in the meadow". This book not only introduces children to arctic animals, but involves singing, counting, movement, and rhyme. This book was a big hit at our house as my boys are very "active" listeners! Polar Bears by Gail Gibbons is a great first informational text about polar bears. There is a lot of information included. Information is shared both in the text and visually which is helpful for young readers. Children can discover facts about bears such as size, location, feeding habits, families, and dangers that are faced by bears. Polar Bear Journey by Debbie Miller is a true story of a mother bear and her newborn cubs. Readers get a glimpse into how the bears develop and how they move through out the arctic landscape in search for food. It is a beautifully illustrated and fascinating to read. Lost and Found by Oliver Jeffers is the story of a boy who finds a penguin at his front door. The boys decides to return the penguin. It is an adventurous journey that builds a lasting friendship. Penguins by Gail Gibbons is an nonfiction book that is great for a polar regions unit. This book is fun because it discusses the variety of types of penguins. National Geographic Kids Penguins The NatGeo kids nonfiction books are great for early readers too. I love that these books use more text features like maps, labels, text boxes yet the pages are not overly busy. There is also a NatGeo version of the polar bear book too. As I was looking for great books for this unit, I found there are tons of books written about penguins and polar bears. There is a good deal of high quality informational text as well as nicely written literature. We've spent a lot of time exploring the animals of polar regions with some of these great books. Do you have a favorite book you could add to this unit? Leave it in the comments and let's keep the list growing!! Very thorough and well done! This is practically a unit. I love the titles you selected!